I am trying to keep all sorts of things in mind as I prepare for Halloween. It might seem like it's a while away, but it's only 4 months out! One thing I hadn't thought of until now is redecorating the bathroom for the autumn holiday season. 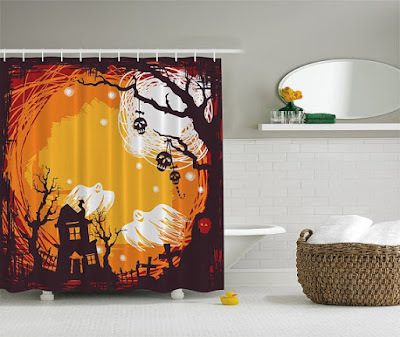 One big and simple thing we can do to set the spooky mood is change out the shower curtain! Check out these Halloween curtains on Etsy. This is definitely my favorite shower curtain out of the three. I think that this Halloween Spooky Night curtain wouldn't clash as much with my current bathroom decor. It's all warm colors and would work great for a simple change. The artwork is also really cool - I like that style, especially for Halloween! 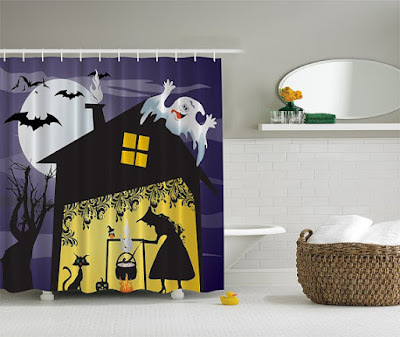 If you have kids, then this Witch, Ghost, Bats curtain is a great fit. It would be even better if it was in your kids' bathroom! It's goofy and more welcoming. Plus you can keep it up for as long as you want during the Halloween season. It's not going to scare them in the middle of the night (hopefully). Here's a neat Jack O' Lantern curtain. It's a little less spooky, and has a bit of a "cartoony" vibe! I like the idea of changing out your bathroom decor like you swap other things for the holiday. The first thing I notice in the bathroom is the shower curtain. 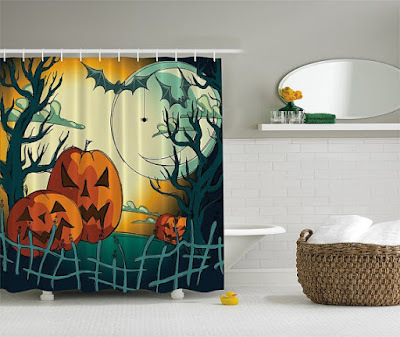 Wouldn't it be cool to have one of these Halloween shower curtains hanging up? Comment down below and tell me what other decoration ideas you have!